We specialize in the elimination of Silverfish in Gilbert, Chandler, Arizona area. Ants are common intruders that moist areas in homes. These nocturnal insects can be found in places with high humidity, like basements, attics, bathtubs, sinks. Their main characteristic is a teardrop-shaped body with three long bristles at the tail end. They draw their name from the silvery metallic shine of the scales that cover their body and the wiggly motion they make when moving. Silverfish can be 0.5 - 1" long and are completely wingless. Silverfish feed on sugar and starches. They can do significant damage to household items, such as book bindings, wallpaper, photos, carpets, cotton clothing, coffee, hair, and even some paints. 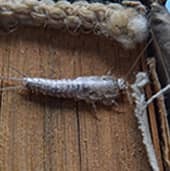 Silverfish are attracted to starches contained in glue and plaster which makes books and wallpaper some of their favorite snacks. When deprived of food, however, silverfish are able to survive for up to a year as long as they have water. Due to their nocturnal nature and high dependence on water, silverfish tend to congregate in dark and moist crevices. Silverfish do not transmit diseases and pose no significant danger to humans, although they may cause allergies in some. Although occasional silverfish that wandered into your home can be easily eradicated with store-bought traps or bug sprays, a larger infestation requires professional help. It takes a trained pest control specialist to identify and the silverfish hiding places and to carry out the careful application of proper pesticides. Since silverfish are highly attracted to moisture, the best prevention method and properly ventilating the most humid parts of your home. Opening windows, using extractor fans, and sealing cracks in the walls, especially in the bathrooms, are all effective prevention measures against silverfish. At Simply Green Pest Control, we create an individual approach to every client and every home. With custom pest control plans, we help you protect your property and save money.